I had no idea the 3rd Generation had an arm rest! Leather needs an overhaul as does the paint but I think it might be a decent start to a project. Manual too. Buy it immediately! You won't find a better project base. They were rare and at this age, the seats always look as if a family of Bengal Tigers owned them somewhere along the way. Make sure it's straight and mostly there, but otherwise, snap it up and get to work. You can't beat that price for a rare, highly desirable 3g. Hey I bought this. I just registered on this site and submitted a post. I also tried uploading pictures from my iPhone but it didn’t work. Welcome to you! Do us proud with this car. 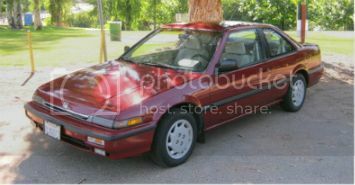 ever since I picked up my 88 I've been looking for an SE-i and still haven't seen one. Should be a cool project. The SE-i is as close to the late 80s Acura Legend as you can get. It was such a beautiful luxurious last 3rd Gen Accord. It jupt was way ahead of the time when you look at it. Compared to other cars of the same vintage.